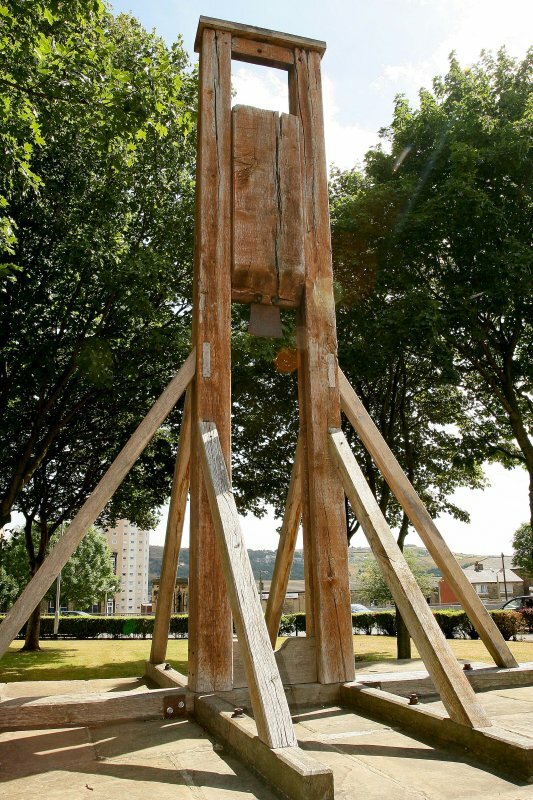 The first use of a guillotine for execution by decapitation was in Yorkshire England with the 'Halifax Gibbet' around 1280. The Halifax Gibbet was a menacing wooden structure made of two wooden uprights, with an horizontal beam and braces, standing 15ft tall. The cutting blade was axe shaped weighing 7lb 12 oz, attached to the bottom of a massive wooden block that slid up and down in grooves in the uprights. This was held up by a rope. Once the condemned prisoner had been securely fastened the executioner would pull the rope. But the executioner could be the victim of the crime, a crowd of people, even a horse or sheep! But they were always cheered on by the crowd. The weight of the blade and the speed at which it fell would decapitate the condemned. The Halifax Gibbet was used on market days. This would ensure many people were in the town to witness the execution and the hope was that the fearsome sight of the Gibbet would act as a deterrent to those who might have considered a life of crime. The first recorded use of the Halifax Gibbet is in 1286 for the execution of John of Dalton, but it is not known what his charge was. An official register of Gibbet executions was not commenced until 1541; but between that year and 1650 there were only 54 people sentenced to death, perhaps indicating the effectiveness of the device as a deterrent. The machine remained in use until Oliver Cromwell forbade capital punishment for petty theft. The Halifax Gibbet was used for the last time, for the execution of two criminals on a single day, on 30 April 1650. The first recorded use of what was known as the guillotine in France was in 1789.